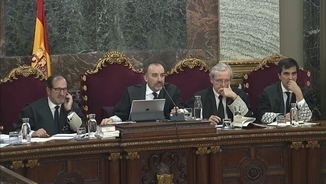 The lieutenants from the events of September 20 in 10 sentences: from accusations to Sànchez to "they will kill you"
The two Guardia Civil lieutenants in charge of the searches in the Ministry of the Economy on 20 S questioned the role of Jordi Sànchez on that day before the Supreme Court. They are the lieutenant that acted as judiciary police in charge of the search of the Economy building on 20 S, identified with Police ID number C57393S, and the lieutenant in charge of the security of the judiciary committee, identified with Police ID number B35974S. The officer in charge of the judiciary police operation, who took the stand in the morning, stated that the former president of the ANC did not display the cooperative attitude he should have shown. 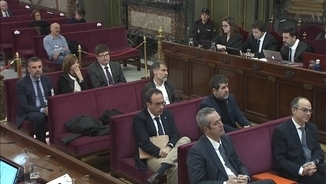 He agreed with the officer in charge of the security of the operation, who stated in the afternoon that Mossos inspector Teresa Laplana "assented" to whatever Sànchez said. 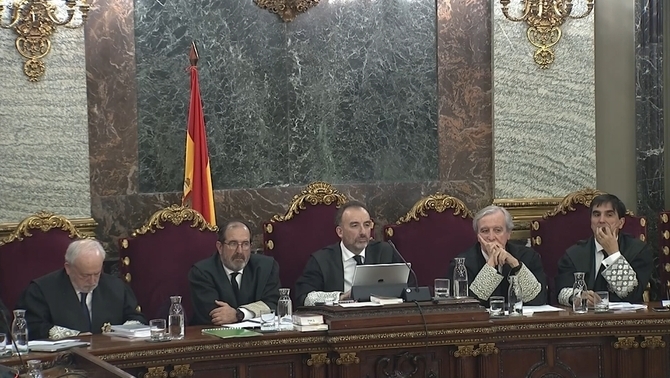 The two witnesses referred to the long-barrelled weapons that were inside the patrol cars that the officers parked on the street.They spoke of rifles rather than riot control equipment, as former head of the Guardia Civil in Catalonia Ángel Gozalo stated in this same trial. The point they disagreed upon was on the suggestion of mobilising a helicopter to evacuate the court secretary. 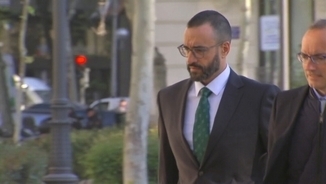 The first witness stated that, when asked by the her, the person laughed to "play down" the situation, whereas the second stated that she requested that vehicle to be ready just in case it was finally necessary. TIP C57393S "Even though he said he had a cooperative attitude, he never accepted any of our proposals. He did not even suggest them, he did not even suggest them to the people, he did not even attempt to do so [to let uniformed personnel and the arrested parties pass through in their vehicles]." TIP C57393S "I find it grotesque to have to manage security with the president of an association. If the interlocutor... He may present himself however he sees fit, but security should be managed between law enforcement services." TIP B35974S "Late in the afternoon I told Sànchez that, if he had been able to call the September 11 demonstrations, he should kindly call off the demonstration. Sànchez told me he could not do anything about it, that the people would not allow him to call off the demonstration." 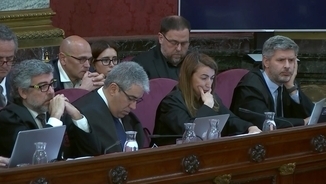 TIP C57393S "Ms. Laplana who, as far as I know, was the one in charge of managing requests for support in order to maintain public order, kept a low profile and obeyed Mr Sànchez's decisions." TIP B35974S "She assented to what he said, she said she agreed with it, and that was almost it." A mossos d'esquadra officer said "If you go out with the boxes, they will kill you"
TIP C57393S "We were to leave among the civil servants, but we had to carry the boxes of evidence. At that time, the Mossos d'Esquadra officers literally said to us: "Are you crazy? If you leave with the boxes, they will kill you." With this I would like to highlight that the objective element of risk did not only affect Guardia Civil officers, but also these comrades." TIP B35974S "I was unsure about it. I would not risk having the court secretary leave through here. I would if there was a police cordon; we could consider it if there was a BRIMO cordon. But it did not feel safe with a cordon of ANC volunteers." TIP B35974S "In each patrol car they are kept where it is possible and where they are the least obtrusive, usually in the trunk. (...) Since we were carrying so much equipment, it was easy for them to be covered. To take them to the search would have been absurd and, moreover, it would have given rise to social alarm; there is no need for long-barrelled weapons or riot control weapons to support the legal committee. It would not make any sense." TIP B35974S "I have been in service for 31 years, I have participated in public order services, riot control services, terrorism services of all manner, and I had never seen what we saw there, because the cars were parked where there were 40, 50, 60,000 people, people are on guard because the cars cannot pass, nobody has touched a vehicle, nobody placed stickers, and nothing ever happened; full of equipment, and nothing, nothing had ever been stolen from me." 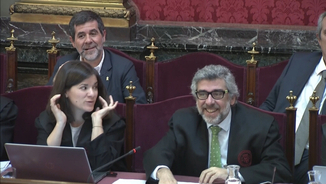 Baena: Catalonia was "a powder keg" in the insurrection period "from September 20 to the enforcement of article 155"